As a debut novelist, has this been a dream experience? The reviews and reception has been awesome! It has! The whole process has been a dream really, from signing with my literary agent Camilla Wray at Darley Anderson to being published by Penguin Random House in the US and Simon & Schuster in the U.K. And then to find out pre-publication that Reese Witherspoon had read and loved the manuscript and optioned the film rights was absolutely thrilling. It was a real pinch yourself moment the night we found out Something in the Water had made The New York Times bestseller list as well. It stayed at #1 on the NYT bestseller audio list for 12 weeks and is still hanging in there after 4 months. As an actress, at the whim of other people’s stories – did you feel there was a story that wasn’t being told, that you wanted to tell? I think there’s always room for more female led stories. Stories where the protagonist is an everywoman, not an anomaly, with all the facets and strengths of any other human being. Something in the Water has been optioned by Reese Witherspoon, can you tell us more? Yes, it all started when the book was still a file being passed around agents and producers not that long after I signed with my US publisher. I got a very surreal phone call saying Reese loved it and there was a bidding war which was won by Fox 2000 and Reese’s company Hello Sunshine. It was just so bizarre and wonderful. You’ve worked alongside some amazing actors, do you have a dream cast in your head for the film adaptation? I’m really looking forward to hearing more once the project gets to the casting stage! I did get a call a few months ago from Hello Sunshine who were discussing some really exciting names! Do you have any literary heroes or influences that played a part in your writing? Absolutely. I love a good thriller, Gillian Flynn being one of my favourites of the genre. I like the dark humour and strangeness of Chuck Palahniuk and Ottessa Moshfegh. My favourite book of this year so far is Andrew Sean Greer’s Less which a real masterclass, it is so evocatively written you feel you’ve been on Less’ journey around the world with him. Have you been to Harrogate before? Yes, it’s such a lovely place! I stayed here whilst I was filming on one of my first jobs, an ITV adaptation of Jane Austen’s Mansfield Park. We all stayed at the Swan I think. I also stayed over last year during filming on the Christmas special of ITV’s Victoria. There are so many stately homes in the area it’s the ideal period drama filming location! Harrogate is also home of course to the world’s biggest crime writing festival, hosted in the Swan hotel where Agatha Christie was famously found in 1926 after her disappearance. You’ve starred in Christie productions, was she an influence? I recently played Romaine Vole the lead in Agatha Christie’s Witness for the Prosecution in the Westend so Agatha Christie has definitely been on my mind lately! It was interesting when researching the play to find out more about her as a person, anyone who knows the play will know that Agatha changed the ending of the play after finding out about her husband’s affair – which adds real edge and bite to the twist. I read your next book is inspired by the true life story of the piano man who turned up in a suit with no memory; have you consciously chosen the crime/thriller/mystery genre, and if so, why? That’s an interesting question. I think at the moment there is real thirst for fast paced thrillers. Even in non-fiction, true crime is more popular than ever with new and brilliantly made Netflix programs and podcasts coming out all the time. We’re all fascinated by what compels people to do the things they do and why. Finally, Harrogate is renowned for ‘something in the water’ thanks to its (spa) waters! Will you be tempted to try out its famed Turkish Baths? Yes, definitely! And I’ll be spending a substantial amount of time in Betty’s too, so put the kettle on Harrogate! 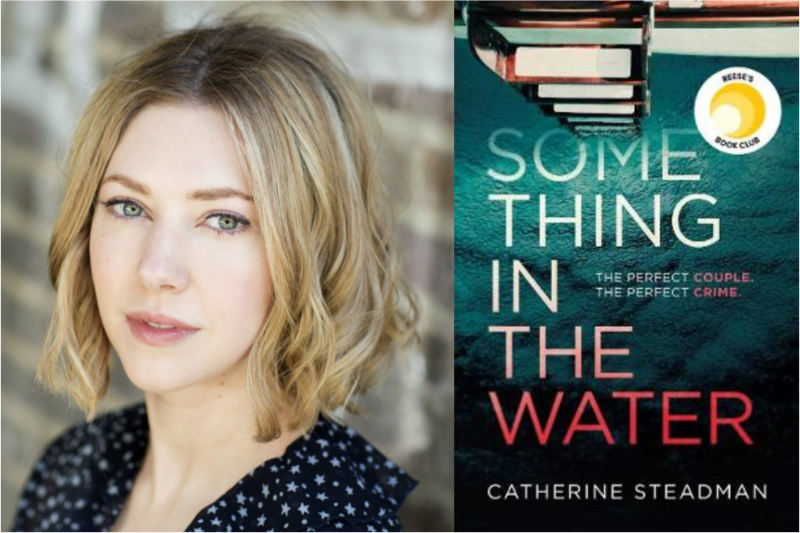 Catherine Steadman will speak at 3pm on Friday 19 October at the Crown Hotel at the Raworths Harrogate Literature Festival, featuring John Simpson, Dr Jane Hawking, David Starkey, Robert Ince, Oz Clarke and more. Click here for the full line-up or to book call the Box Office on 01423 562 303.